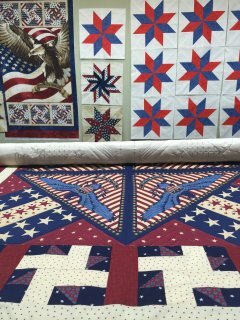 There are many quilting organizations that offer opportunities to participate in making quilts to comfort and honor our military personal. Since I am a member of the 'Quilts of Valor' organization I have provided you with information and links to the National website. I hope you look around at their site to become more aware of who they are and who they serve and maybe you may join a Chapter near you! My interest in this wonderful charity was introduced by a local chapter of the Quilts of Valor hosted by Montavilla Sewing Center in Gresham, Oregon. I was asked to use my long-arm sewing machine (Gammill Statler Stitcher) to help the group quilt some of the quilt tops for the 70 or so servicemen/women returning home from Iraq/Mid East. Although I have played a very small part, it has been my pleasure and honor to give back to those who have sacrificed their lives for my freedom. I have a tender spot in my heart because my son has served in the United States Marine Corp as well. If you are new to quilting, joining your local chapter lends a perfect opportunity to learn. The added bonus are the wonderful people you will meet! I will be adding the PDF patterns of those I can find for your convenience although most you can find on their websites which I have linked below. This group's goal is simple -- to blanket each wounded or injured soldier who has been affected by war. 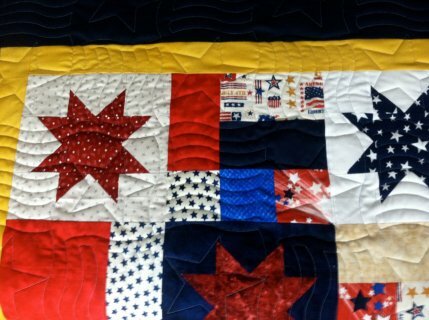 The Quilts of Valor Foundation was founded by Catherine Roberts, a Delaware quilter who contacted a U.S. Army major because she wanted to sew a blue-and-white Ohio Star quilt and donate it to a wounded service-person. Soon, she envisioned every injured soldier waking up wrapped in a homemade quilt. After her first quilt was finished, Roberts put out the word that these blankets were needed quickly. Soon, hundreds of quilts were distributed through chaplains to about 70 U.S. military medical centers. As of now, almost 162,750 quilts have been given to injured soldiers. The group's secondary mission is to teach children to sew as a way of helping them become civically involved through volunteering. Anyone can learn to quilt. All it takes is the desire and of course a sewing machine. Contact your local chapter to find out when they meet and they will assist you in what you need to know to begin. Sew Bee Happy Quilting! Our Local chapter is sponsored by Montavilla Sewing Center in Gresham, Oregon. 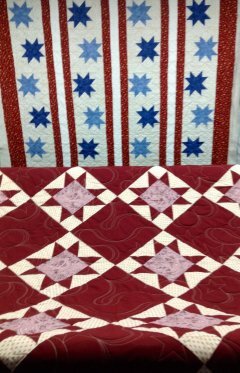 Below is a slideshow of some quilts made by the gals and photos of quilts being presented to our well deserving veteran friends. The quilts in this video were long-armed by Quilterbee. Thank you to Montavilla Sewing Center; all the lovely ladies who devote their time, energy and money for the supplies to make the quilts and of course our Veterans for their dedicated service to this wonderful United States of America.